La Grange, Illinois. September 1989. Once again I am blessed with the opportunity of a lifetime, attending the first-ever General Motors Open House. The grin on my face and two bags of goodies says it all! 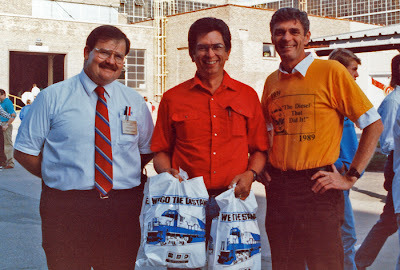 I had met these two fellows earlier that year, at a fire department trade show in Washington, D.C. When we exchanged business cards, I noticed that Tom, (blue shirt and tie) was Chief of Security for General Motors, and I made some exclamation like “Wow!” As we were shaking hands, I told him that I was an avid railroad photographer, where upon his grip got noticeably tighter, as he said “I’ve finally got my hands on one of you!” Apparently he spent considerable time chasing photographers off the property! As I recall, the fellow in the “Diesel That Did It” orange shirt was from the Public Relations Department. Both gentlemen expressed how astounded they were over public response, and noted that dozens of folk had slept overnight in the corporate parking lot. La Grange was the mailing address for Electro-Motive Division. However, the headquarters, engineering facilities and parts-manufacturing operations were actually are located in the adjacent village of McCook, Illinois where the the locomotives were built. 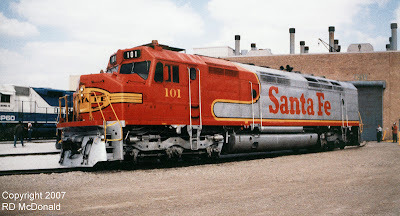 She was one of nine “cowl” FP45’s built for Santa Fe for service on the El Capitan and Super Chief in 1967. Basically taking the SD45, and covering the walkways, yielding g a more pleasing 3,600 hp locomotive for sleek, cross country passenger trains. A gentleman by the name of Andy Sperandeo, Executive Editor of Model Railroader Magazine, has documented the "War Bonnet" paint scheme all the way back to 1937. The last of this series was phased out in 1999, and donated to the Museum of the American Railroad in Dallas, Texas. Also see my original story of the Open House with additional photographs, by “clicking” on General Motors Open House on the “Labels” list to the right, and more photos at Rail Pictures Archives.